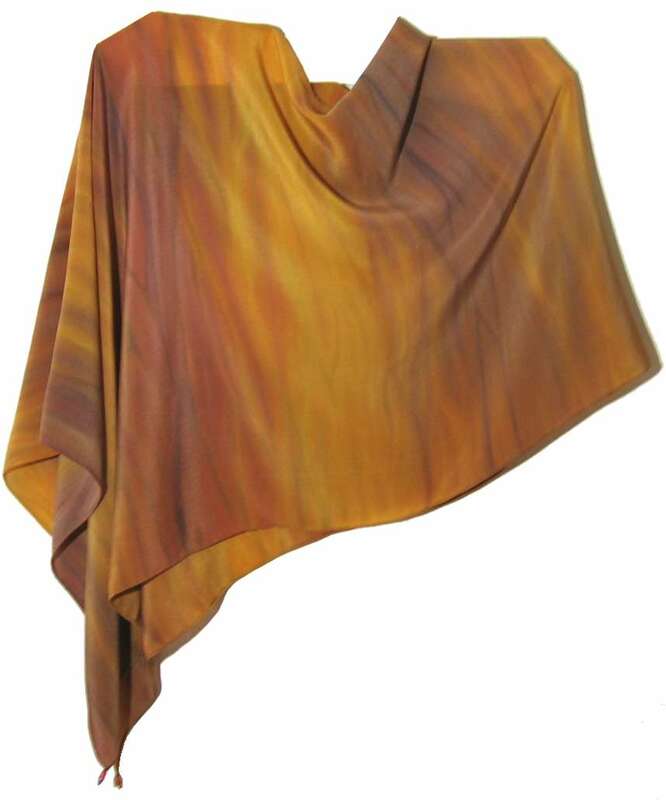 This piece is perfect over a little black dress, or jeans and a T. It has a unique asymmetrical drape that moves gracefully with a weighted bead trim. Perfect for social events...no more struggling with a wrap! This elegant velvet cover-up will turn heads! It has a unique asymmetrical drape that moves gracefully with a weighted bead trim. Perfect for social events...no more struggling with a wrap! "A Moire In Indigo" explores the phenomena of moiré. The word moiré is thought to be derived from the word mohair and has been used by textile artisans to describe patterns in weaving. In today's electronic design media the moiré effect is thought of as a nuisance that must be filtered out. This piece celebrates the moiré and its' inherent beauty. The pattern is created by a layering of samples (through a multiple of shibori processes) that give an incomplete representation of the whole. 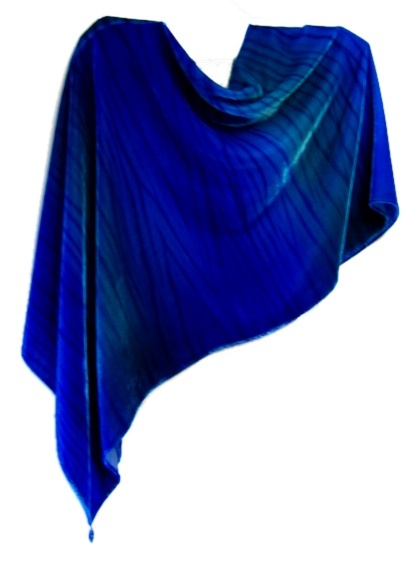 This multi-wrap is created using a variety of shibori ‘shaped-resist’ dye and pleating techniques. The organza fabric has also been scoured, in concert with the shibori techniques, to remove some of it’s sericin proteins. The result is a wonderful play of colour and texture. In addition to being beautiful and unique, this piece is infinitely wearable. It can be worm as an assymetrical poncho, as a shoulder wrap, or as a scarf. The possibilities are endless! TECHNIQUE: Various shibori on organza. 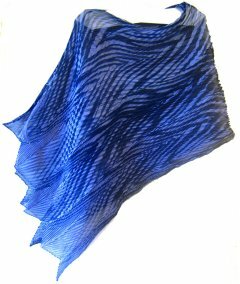 BELOW: Moire worn as a scarf.